I was going to write a piece about the 4th of July, and then came across this great Article from last year, by our Past President, John Gargett. He did a fabulous job, so for those who missed it or would like a reminder, here you go…Thanks John! The 4th of July in Birch Bay is certainly an eagerly anticipated event by people who love fireworks. However, not everyone loves fireworks, they can be dangerous to people and pets, noisy and pollute our bay. Let’s remember that while fireworks are part of the 4th of July, that they should be used with care and responsibly. Again this year Birch Bay will have a strong presence of our Whatcom County Sheriff’s Office and our Fire Department. There will be a command center on the beach in the middle of the bay, officers will be patrolling on foot, as well as in vehicles, and the fire department will be staging equipment in several locations. Their primary job is to help ensure public safety. In this regard, they will be on the lookout for intoxication, open use of liquor in public areas, illegal fireworks, as well as responding to incidents should they arise. Know the laws. Communities typically have different fireworks ordinances; check the fireworks safety website for a complete breakdown of local laws and regulations. Avoid illegal fireworks. Licensed retailers are only allowed to sell legal fireworks. Check with local police or fire departments to determine which fireworks are permitted and visit the Fireworks Ban or Restricted Sales/Use list for statewide sales and discharge periods. Exercise safety. Never place any body parts directly over fireworks when lighting and ensure that proper adult supervision is available when children are involved. Be prepared. Keep a bucket of water or a garden hose handy in case of a mishap; read instructions and warning labels carefully before igniting. Don’t pollute. When festivities are over, clean up the area; pour water over extinguished fireworks to prevent fire and dispose of litter properly. Be Aware of yourself, family, friends as well as those around you. Have a bucket of water or hose available. Assist the Fire Department and Sheriff if needed. Do not use fireworks if you have been drinking. Keep a clear distance from others when using fireworks. Be Clean by removing all used fireworks from the beach and putting in your garbage, and on the morning of the 5th, walk the beach and pick up debris. Have a safe and enjoyable family 4th of July, and please, also remember that the 4th of July is also a time to reflect on the importance of the day as part of our Nation’s history. RCW 70.77.395 (State Law) – Fireworks sales and discharge laws. Dates and times common fireworks may be sold or discharged. 12 p.m. (noon) to 11 p.m. 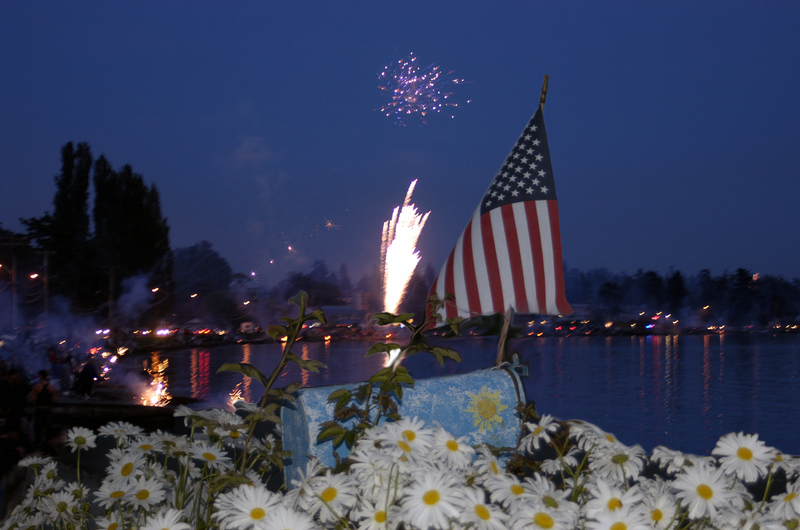 This entry was posted in Birch Bay Chamber of Commerce, Birch Bay Community, Birch Bay Waterfront and tagged 4th of July, birch bay, Fire Department, Fireworks, Independence Day, John Gargett, Pyrotechnics, Safety, Sheriff, Whatcom County Sheriff. Bookmark the permalink.